Good morning friends! Want to see what we do on a daily basis for 2nd grade? I’ve had a lot of requests for another What’s in the Workbox Wednesday post, and so today we’re taking a look into Miss Ladybug’s boxes. She does complete all of these activities each day, with the exception of art. That is currently only done once a week. 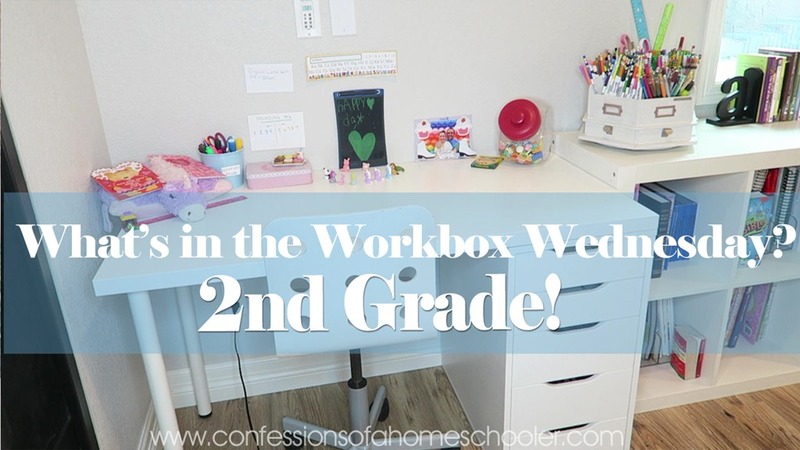 Let’s get started: Watch my What’s in the Workbox 2nd Grade video here! 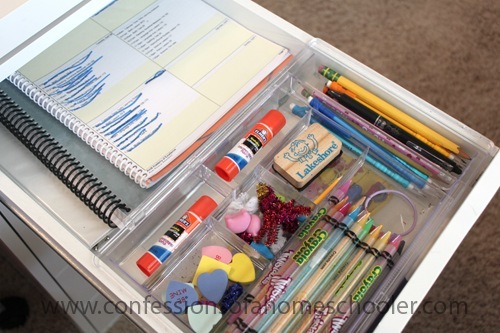 1) Just like the other’s, her top drawer houses our expandable drawer organizer and it holds all of the pencils, glue, erasers, etc. It hangs on the drawer sides, so it can slide back and forth out of the way which is a nice feature. It also expands/contracts to fit most drawer sizes. 2) This drawer also holds her Grade 1-2 Word of Life Daily Devotion. 3) It also has her weekly assignment printout. I get a lot of questions on this, and it’s just a report printout from www.homeschooltracker.com that I print and spiral bind for them. Granted a few things changed since we started the year, so you might prefer to print this out on a weekly basis, but for the most part it works to help him keep track of her daily workload. I forgot to show it, but she also has her Daily Learning Notebook (You can choose either Elementary level manuscript version. or Elementary cursive version, I normally do cursive in third grade.) – These are free downloads found on my blog, and they come in a variety of styles. I have an elementary specific one I like to use for ages 6-11. I also offer them in a variety of languages if you’ve already done the elementary notebook and want something new! It’s just a fun way to cover a variety of skills each day. 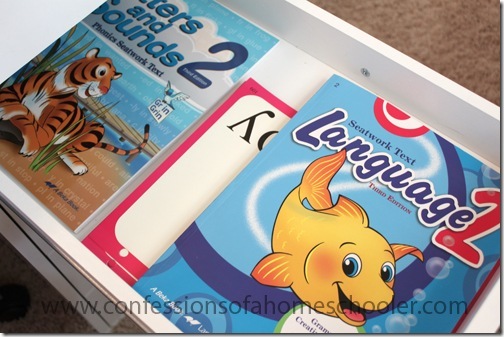 Drawer 2 is our math drawer. Miss Ladybug is currently using Math U See Beta (the orange books under the box of blocks). I normally pull out each day’s work for her so she knows what to do. 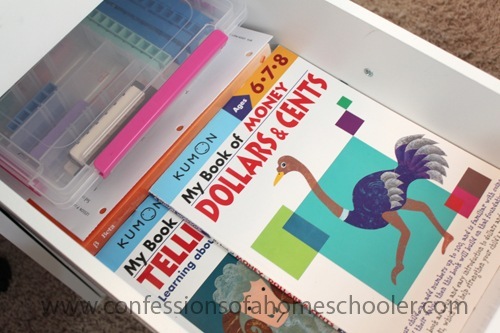 She is also working through the Kumon Dollars & Cents, and the Kumon Telling Time book. Math U See does cover these topics, but she really needed some extra work on them and these books are great for that. One thing I particularly like is that they’re in color, so that has helped her with money quite a bit. In her third box I keep her Abeka Letters & Sounds 2 and Language 2. I also put the Abeka Basic Phonics Flashcards for her to review each day as well. I normally pull each day’s worksheet out and put it on top of the books. But I wanted you to see which one’s she was currently working on. In her next drawer we keep her Vocabulary Workshop Purple. I think you can find them for less on Amazon or Christian Book, but I just wanted to show you a link so you could see what she’s doing. She does one worksheet per day. So far we like these sheets. Each topic comes in sections. So you learn the words, do sentences and other activities, then do a quiz. She is also working on All About Spelling, but since it’s teacher led, there’s nothing in her box for it. She also does a Spelling You See worksheet each day as well. What’s not in her boxes? This year we used Abeka’s 2nd grade history and science. They’re not in her workboxes anymore however because I didn’t really follow their schedule, and so we already read through them both! She also participates in a once per week options program where she is taking Language Arts, Science, Spanish, PE, and music. 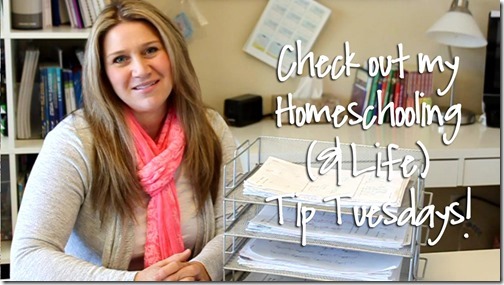 If you’re wondering about the options program, you’ll want to contact your local school district to see if they offer an options program for homeschoolers in your area. She also does ice hockey and swimming, so I think we’re busy enough for my taste! Anyway, that’s it for Miss Ladybug’s 2nd grade workboxes. I hope you enjoyed this video! For links to all of Miss Ladybug’s 2nd grade curriculum make sure to check out our 2016-2017 2nd Grade Curriculum post here! What storage container is that for the MUS manipulatives? We’re currently using the wooden storage they used to sell and it’s so cumbersome :/ would love an alternative! We used a clear bead storage box from Michael’s. It has movable dividers which allow you to make each section fit the MUS blocks. Plus it locks closed making it portable and easy to carry 🙂 FYI: The 100 blocks don’t fit in there though. Have you ever done a review of your Bible curriculum? I’d like to do something other than what our homeschool resource room has to offer next year. 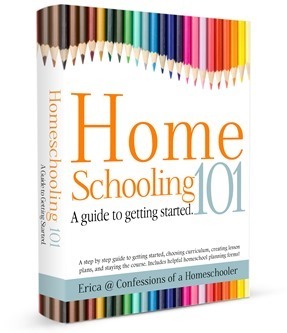 I will have a 1st and 3rd grader… I liked that your book is a workbook as well, but I wondered if it would be ok to use if our church isn’t doing that program as well? You mentioned a Daily Learning Notebook (You can choose either Elementary level manuscript version. or Elementary cursive version) that was a free download on your blog. I haven’t been able to find a free version on these.